This Personalised Childrens Initial Charm & Pearl Bangle features a dainty round sterling silver tag charm with the child's initial handstamped onto it, and a delicate freshwater pearl, both hanging from the handformed silver bangle. All little girls would adore this pretty silver charm bangle, it would make an ideal piece of wedding jewellery for a young bridesmaid or flowergirl too. Childs silver bangle approx. 5cm diameter. 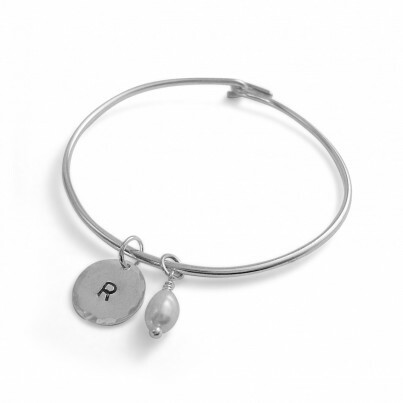 Round silver initial charm approx. 10mm wide. Ideal for children aged 5-9 years old. Please select the initial that you would like from the dropdown list below. Dream of Silver's childrens jewellery is not suitable for handling by very young children, due to the small parts which may cause a choking hazard. Children should be supervised when wearing our range of childrens handmade silver jewellery as it is not a toy. Jewellery should not be worn overnight. Free UK delivery and gift box. This item is usually despatched within 1-3 days. All UK orders are sent by Royal Mail 1st Class Recorded 'Signed For' Delivery. Our standard delivery time is 2-3 working days, however occasionally during busy periods orders can take slightly longer. All overseas orders are sent by Royal Mail Airmail service. Customers can upgrade their overseas delivery to require a signature on delivery, these orders will be posted by Royal Mail Airsure or Royal Mail International Signed For services. Our standard overseas delivery time is around 7 working days, however occasionally during busy periods it can take slightly longer. Please note, Dream of Silver takes no responsibility for items lost in the post if a customer has selected the basic Royal Mail Airmail service. Overseas orders may also be subject to customs and import charges and delays - see information below. 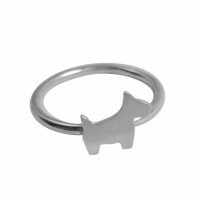 Some rings and personalised jewellery items are made to order and may take up to 2 weeks to be delivered. These items explain their delivery times within their individual product descriptions. Please remember that each item is individually handcrafted and we do not supply mass-produced silver jewellery - for this reason our pieces sometimes display textures and individuality which adds to the authenticity of the handmade item. Due to the nature of handmade silver jewellery products there may occasionally be slight variations in the size and colour of some jewellery items. All measurements are approximate. Dream of Silver's handmade silver jewellery is not suitable for handling by very young children, due to the small parts which may cause a choking hazard. Children should be supervised when wearing our range of childrens jewellery as it is not a toy. Jewellery should not be worn overnight. All handmade silver jewellery purchases from Dream of Silver include complimentary gift wrapping. They are wrapped in white tissue paper and set in a luxurious square white gift box printed with the Dream of Silver logo. Customers outside the UK may be charged import or customs fees by their local customs office once the parcel reaches its destination country. These charges must be paid by the recipient of the parcel. Dream of Silver recommends that customers contact their local customs office for current charges before placing an order. Parcels can be also delayed by customs offices, Dream of Silver has no control over this. All handmade silver jewellery purchased from Dream of Silver is protected by a full money back guarantee, allowing a full refund or product exchange if for any reason you are not happy. If you are not satisfied with your silver jewellery you must contact us for a returns form, and then return it to us unworn and in its original condition and packaging, within 7 working days of receiving it. Any sterling silver jewellery returned to us must be sent by Royal Mail Special Delivery at your own cost - Dream of Silver is unable to refund the cost of return postage. If your handmade silver jewellery order arrives damaged please contact us within 3 days of receipt. Dream of Silver will be happy to refund, exchange or replace your damaged jewellery.